Heat oven to 350°F. Spray 8-inch square pan with cooking spray. In large bowl, stir all bread ingredients. Spread in pan. Bake 15 to 17 minutes or until toothpick inserted in center comes out clean (top will not brown). Cool. Meanwhile, in medium bowl, stir all egg salad ingredients except lettuce. 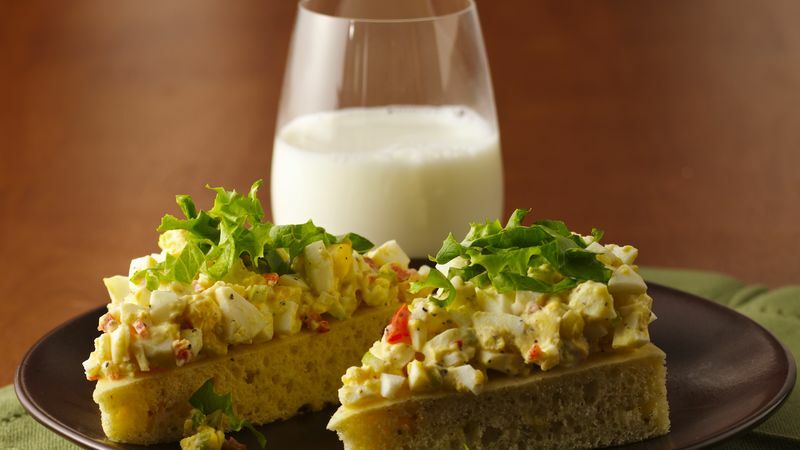 Cut bread into 4 squares; top each with 1/2 cup egg salad and 1/4 cup lettuce. Season with additional salt and pepper, if desired. For a fancier version, substitute roasted red bell pepper for the fresh bell pepper. Hard-cook the eggs 1 or 2 days before making this recipe. Or to save even more time, look for hard-cooked eggs in the deli or dairy section of the grocery store. Serve with a mixed fruit salad for a light lunch.